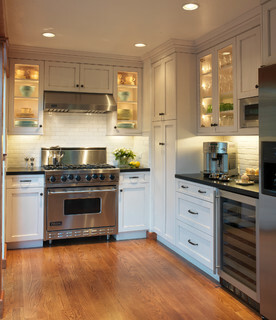 When it comes to your home renovation, choosing the right kitchen cabinets is a job in itself. A big job. Not only do they take up a considerable chunk of real estate, they’re also responsible for providing functionality and setting the overall style in the kitchen. Back in the day, if your kitchen had a lazy Susan, you were at the pinnacle of storage innovation. Thanks to improvements in kitchen hardware design and innovation, storage in kitchen cabinets has become so much more functional and diverse. There’s everything from pullout trays to purpose-built bread boxes to cabinet storage in kitchen islands. 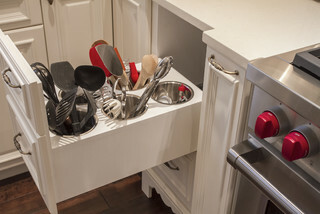 Even narrow spaces that would once have been covered with a false cabinet front are cleverly being utilized as storage for things like cookie sheets. 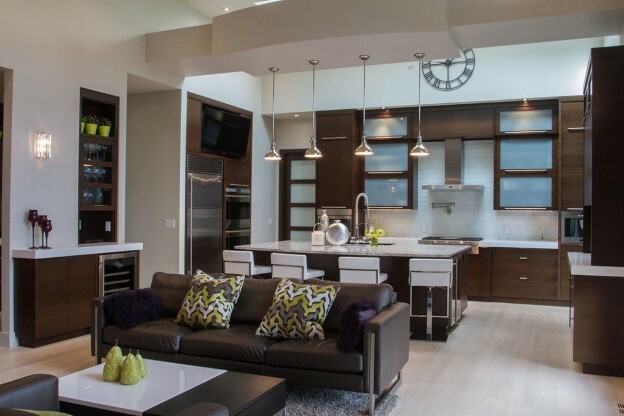 Many Calgary homeowners are going for a sleek, modern look by foregoing handles on their kitchen cabinetry. 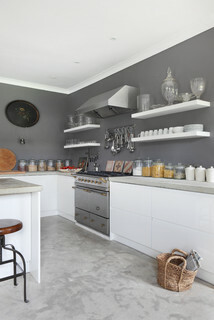 Instead, they’re using either integrated handles (built into the doors—or handle-less cabinets. Both choices will impart a clean, contemporary look to any kitchen and are sure to generate conversation—and possibly some inquisitive looks—from visitors. Sometimes it can be difficult to see in the recesses of a dark kitchen cabinet or drawer. Incorporating some long-lasting, energy-efficient LED lighting as part of a custom cabinetry design is a great way to add practical flair to your kitchen. These inserts can be customized in an endless variety of configurations to ensure you end up with functional storage that meets your needs. Spaces by Oregon City Cabinets & Cabinetry WoodWorks INC. 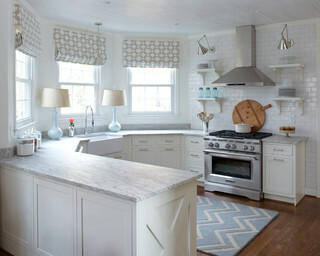 Looking to incorporate the latest trends into your custom kitchen cabinets? Call or email the Calgary woodworking specialists at Athena Industries to discuss your design goals and learn how we can add style and innovation to your kitchen renovation project. This entry was posted in Kitchens, Storage on April 28, 2015 by sproing.